New Vista offers several different types of products and services to fit your application. 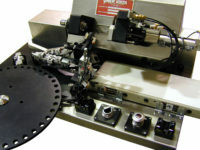 New Vista’s patented Thread-Verification Units (TVUs) and related products are supplied in a variety of configurations, but they all perform the same function: to drive, at high speed, a gage probe into, through, or onto a threaded production parts; and to reverse back out again, thus providing 100% assurance of assemblability. Learn more about how our Thread-reconditioning units, Thread-verification Units, and Toolholders work. In addition to Thread Inspection and Reconditioning, New Vista is experienced in Automation, Machine Tools, and Parts Washers.